Opened in 2002 to much acclaim, the reputation of Druid's Glen has only strengthened since its inception and was named European Golf Resort of the Year in 2005. In the years since the resort has continued to improve, with both the Druids Glen and Druids Heath courses maturing into spectacular layouts. However, the Druids Glen Course steals the show, the 4-time Irish Open host has been compared to Augusta by many great golfers. The superb 5-star hotel at Druids Glen is set in the magnificent Wicklow Hills to the south of Dublin, just 45 minutes from the city centre and less than an hour from the airport. Known as the Garden of Ireland, Co. Wicklow is truly splendid, and as such, the resort boasts a beautiful setting. The award-winning spa and health club is popular guests, as is Hugo’s Restaurant, the winner of two AA Rosettes. Often uttered in the same breath as Augusta, Druids Glen may not have the character of some of the seaside courses around Dublin, but it is one of the best parkland layouts in the UK and Ireland. From the forest that once was home to the Druids, Pat Ruddy and Tom Craddock have created a masterpiece, featuring numerous spectacular holes. The most famous may be the 12th, a delightful downhill par-3 where golfers play over the now famous bank of flowers in the shape of a Celtic Cross, but this is but one hole in a course of classics. The Druids Heath course may be relatively young, but it has already garnered much attention from the golfing fraternity. 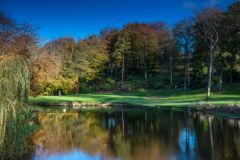 The mixture of heathland, parkland and links makes this one of the most exciting and innovative golf courses to be built in the last few years, and has only cemented Druids Glen's reputation as one of the premier golf break destinations. There are over 1,000 pubs in Dublin, and a visit to at least a few of them to sample the local brew is essential to any Dublin Tour. At 492 yards, the 12th is an especially tough hole to achieve birdie. While the fairway starts by sloping uphill, it then turns to the right and starts sloping left to right towards a dangerous looking pond. To reach the green in two will be a tough ask for most golfers, not only due to the length but also because of the bunkering which surrounds the green from both sides. A fantastic hole, presenting a challenge for all and requiring risk reward golf to make par. The 145 spacious guest rooms are designed for comfort and function and offer all the requisite features from a 5* venue, including high-speed internet access. In addition to the two supreme championship golf courses, the resort has excellent conference capabilities along with an award winning Spa and health club with swimming pool, jacuzzi, steam room and sauna. There are several dining options for guests to choose from. Dine in the stylish, airy surroundings of Hugo’s Restaurant, which holds two AA rosettes, the Garden Rooms and Bar offers stunning views overlooking the famous 13th hole on Druids Glen Golf Course and Woodstock House with its fantastic setting at the 1st tee on Druids Glen. Just love this place. Has recently been extended providing very comfortable bar and restaurant facilities. Food is very pricey for what it is (bar food not terribly adventurous but add in the fact that you can eat in the clubhouse ( franchised out but absolutely wonderful) there is a fantastic choice of places to eat. We received a room upgrade ( as Your Golf Travel requested) and it was a beautiful room overloooking the 13th tee. Staff were, as ever, absolutely wonderful and we would return tomorrow, given it’s proximity to such wonderful golf courses. A beautiful course especially in early Autumn. However our tee time was in the middle of a 3-ball scramble competition which was slow and left the greens covered in unrepaired pitch marks. Even the friendly starter was amazed to see that we had been allocated this tee time. The course was in fantastic condition and looked absolutely beautiful. Never too busy. We just loved playing golf here. Big carries for short hitters but spectacular. LOVE IT!